Hey folks, ScottP starting off the Big Damn Discussion this time. We’re late again and the blame is entirely mine; I do have the excuse of being under deadline on a writing project but there were opportunities to start this post and I didn’t take them. One reason for this is something I mentioned in the last installment of the BDD: examining each episode of Firefly in the manner we have — digging into the guts and pulling ’em apart, sometimes discovering things that don’t work that I never noticed before — has taken a lot of the fun out of the show for me, and I’m not happy about that. As interesting as it’s been to write these posts, I’ll be damnably glad when we’re done and I can go back to just having a good time with the show. 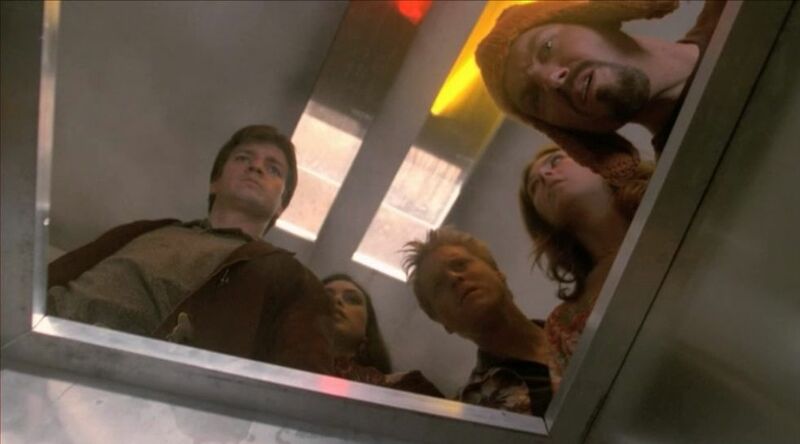 However, this series is about Firefly, not about what makes me cry, so I’ll get to it — but I’m not gonna make such deep cuts into the episode, I don’t think. This one starts off with Serenity docked at a massive space station/mall/carnival where Mal’s been trying — and failing — to fence the Lassiter (from Episode 11, “Trash”). Meanwhile, Simon and Kaylee are checking out a sideshow attraction, billed as “proof of alien life,” but actually an old school “pickled punk,” a deformed cow fetus in a jar. 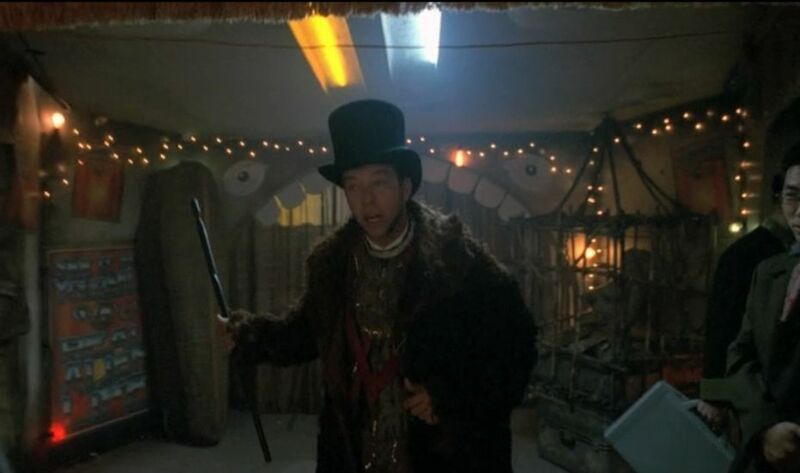 This is an interesting bit of business — the carnival barker’s pitch about alien life, I mean: it never occurred to me while watching Firefly before, but the notion of a universe without alien races, where humans are the whole shebang, is a little disheartening to contemplate. ScottD: I have read several interviews with Joss Whedon that indicate that he had a hard time selling the show because there weren’t any aliens in it. “How will people know it is a science fiction show,” cried execs, “unless the first thing they see when they tune in is someone with a funny forehead?” Joss’s position was that human beings can be as alien and monstrous (and capable of generating drama) as any BEMs. I think this alien-in-a-jar bit is a jab at the prevailing executive perception. But it is also a great bit, very thought-provoking — here are folks way in the future and way out in space, and they still wonder about aliens and there are still carnival barkers willing to exploit that wonder. 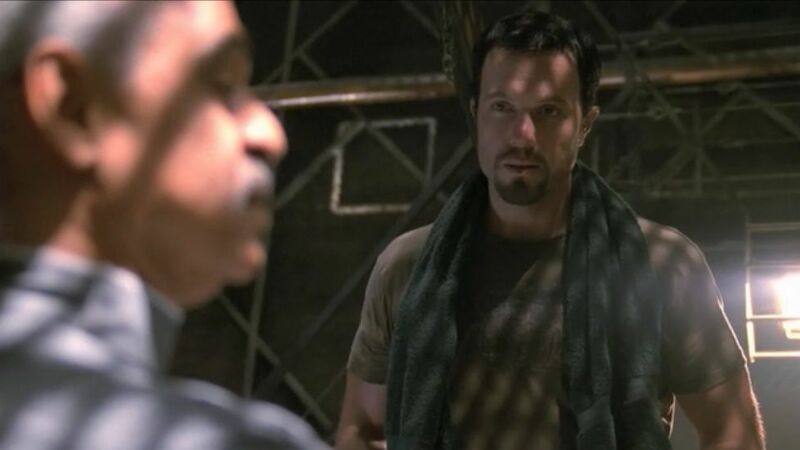 Tanzi: I like the decision to leave out the aliens, Battlestar Galactica made the same choice. It doesn’t really make any logical sense but it helps keep the focus on the very human relationships and problems of the crew. And it avoids the problem of convincingly portraying an alien race within the budget of a weekly TV show. ScottP: In any case, while the two of them are alone in the darkened room with the big ugly cow fetus, Simon awkwardly — and sort of accidentally — compliments Kaylee and she asks him for a little more of that sweet business. Of course, he fails miserably and inadvertently insults Kaylee, who wanders off, leaving Simon with the pickled punk — and Wash and Zoe (who takes the opportunity to rib Simon a little). Elsewhere, Mal and Jayne pick up the ship’s mail. I’m gonna go out on a limb here and say that “The Message,” while one of my favorite (and I think one of the three or four best) episodes of the series, is probably more popular among the Browncoats for being the episode where we first meet Jayne’s cunning hat (sent to him by his mom) than for being the good episode that it is. 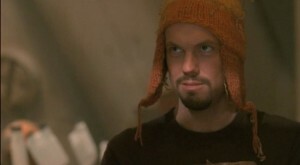 And of course there’s nothing wrong with that — Adam Baldwin gets the most out of that ridiculous hat and makes it seem a very natural thing for Jayne to be sporting, as goofy as it is. "Man walks down the street in that hat, people know he's not afraid of anything." Tanzi: I’ll admit that sometimes I’m irritated by that kind of blatant fan service but ultimately it’s one of the things I really like about the sci fi genre. The creative people know they have a fanbase that’s heavily invested in a show and it’s characters so they’ll do things like this to make the fans happy. Even today, years after the show is off the air, many cast members are active on Twitter and interact with their fans all the time. That one little throwaway bit gives the cognoscenti something to enjoy and a new costume element for the next convention. Doctor Who has been doing the same thing lately, with the fez, Rory’s centurion outfit and Amy’s policewoman outfit. 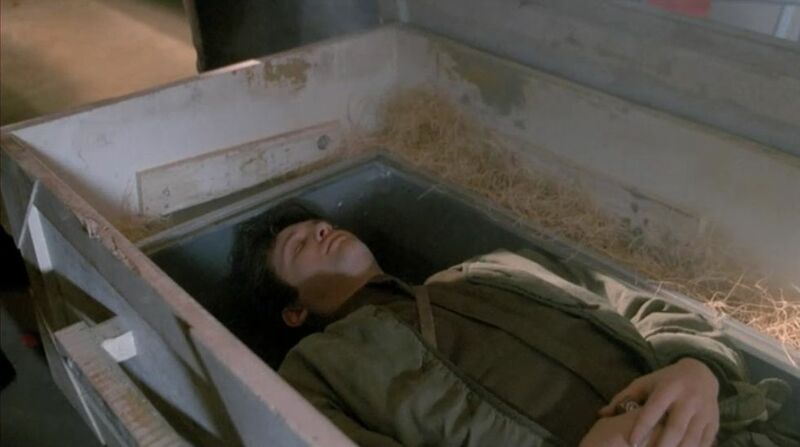 ScottP: Mal and Zoe receive a large crate, which, when opened, reveals a coffin — which, when opened, reveals the corpsified remains of Tracy, a youngish fellow whom we soon learn (via flashback) was an old war buddy of Mal and Zoe’s — not much of a soldier, the kind of kid who always needs saving, but he fought alongside the two and that counts for a lot with our heroes. Once everyone is back aboard Serenity, Zoe finds a hidden — well, what looks like an iPod, containing a message from Tracy, wherein he explains (from beyond the grave!) that he’s fallen in with some unsavory types and is no doubt going to end up dead. He asks Mal and Zoe to return his body to his family — saying that they carried him through the war and he needs them to carry him just a little more. 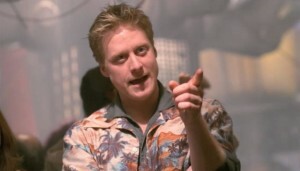 Everyone is affected in some manner by Tracy and his request — Wash immediately heads for the bridge to set a course for St. Albans; Jayne pumps some iron as Book says a few words over Tracy’s coffin, leading into a terrific scene between Adam Baldwin and Ron Glass as Jayne explains that being around a corpse — at least one he didn’t create — makes him want to do stuff, work out or “get some trim,” that sort of thing. 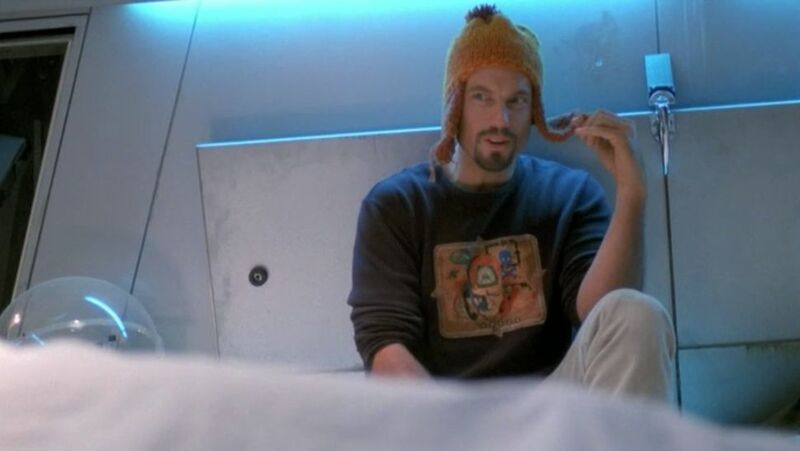 It’s a beautiful moment between these two characters and really delivers some insight into Jayne’s worldview (while giving him more depth, which has been hinted at all along). "My kinda life don't last long, preacher, so I expect I'm invested in making good sport of it whilst I can." Tanzi: I enjoyed this scene as well. Jayne and Book make a good team, it would have been fun to see them teamed up on some capers had the series lasted. I think “if the show had lasted” is our most-used phrase throughout this series of posts. 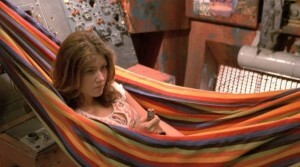 ScottP: Meanwhile, Kaylee lazes in her engine-room hammock listening to Tracy’s message, obviously moved by the lad’s request. ScottD: And in her distinctive wacko fashion, River gets up close and personal with Tracy’s coffin. 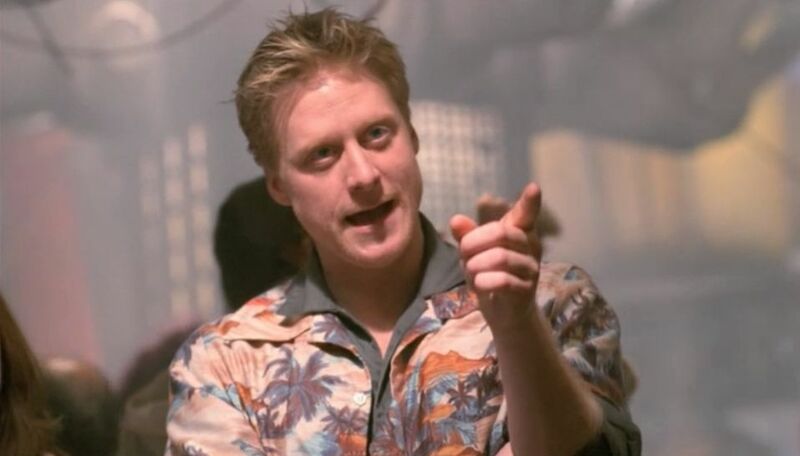 ScottP: However, Mal, Zoe and Inara sit around the dinner table laughing their asses off at a story Mal and Zoe share about a prank Tracy once pulled. A solid sequence all the way around, well-written, well-directed, and well-acted across the board. ScottD: This scene, the “wake for the fallen comrade”, and the previous wartime flashback scenes, are I think very well done and help remind us of the wartime experiences that both bind and drive Mal and Zoe. Even a goof like Tracy kicks in their honor reaction. ScottP: Unbeknownst to our heroes, the mailman back at the space station/mall/carnival has been visited by the space po-po, looking for the crate carrying Tracy’s body and making some rather unusual threats, even for Alliance-types. 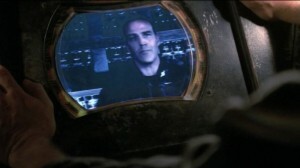 The mailman tells them who picked up the crate and soon Serenity is taking warning shots across her bow. but as Simon begins cutting the body open, Tracy springs to life, screaming and hollering and raising all kinds of a ruckus. Once the dust settles, we learn that Tracy, looking to make a big score, had his guts replaced with synthetic organs — which have to be transported inside a human body — then used a drug to make himself appear dead. 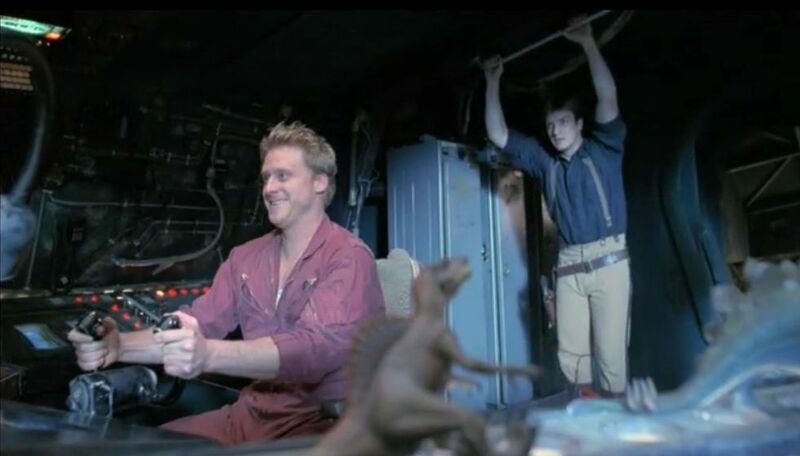 Unfortunately, playing his old war buddies like Tracy did has now put Mal and his entire crew in jeopardy, and that doesn’t sit well with the Captain. 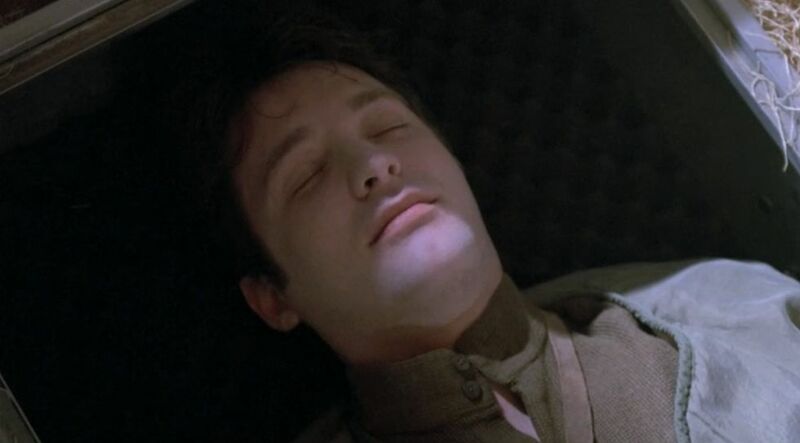 With the “Alliance” thugs closing in, Mal is forced to make a decision that leads to a pretty moving series of events, and like I say, all of this adds up to make “The Message” one of the best episodes of the series. 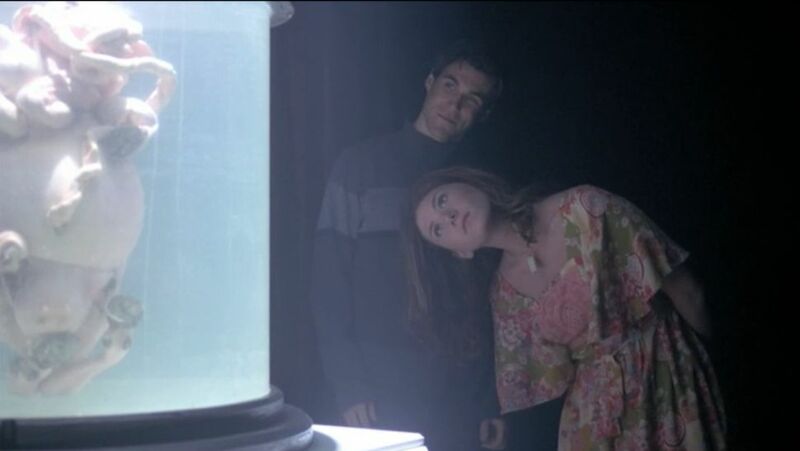 Bonus: plenty of shots of Kaylee’s belly peeking out from under her shirt. ScottD:: Kaylee’s romantic fascination with Tracy is nicely played — she’s not just interested in him as a new guy (especially after Simon’s clumsy diss of her earlier) but she is interested in him as a “romantic stranger”, someone outside of the crew circle. Tracy is also a tragic figure, come back from the dead! Chicks dig that stuff, I guess. More nasty bad guys here, willing to set people on fire to get what they want, pointing up that our “pirate” crew are actually some of the nicer people in the ‘verse. With so many hard cases running around, we can understand some of the hardness that Mal demonstrates — he knows that the real predators are always waiting to pull you down. Tanzi: I thought the central story with Tracy and his little caper was well done. His plan was stupid and doomed to fail but that’s exactly the kind of guy he is. I will say I was taken in a bit at the end when Mal is being such a hardass about handing Tracy over to the Alliance guy. I thought the series was going to take a darker turn but Mal remained true to his character, his loyalty to crew winning out in the end. Maybe not my favorite episode but I liked it.